Cabbage soup! In the instant pot! Because it’s summer and we are in no-cook mode. 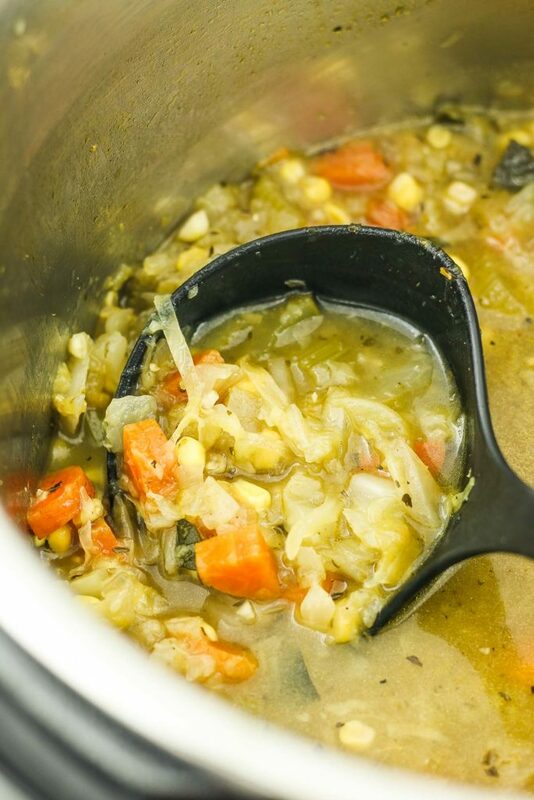 Have you ever made cabbage soup? Is it weird to be thinking about soup in July? I don’t think so. Because I love cabbage and I love soup, and I don’t think soup should be reserved for cold weather only. 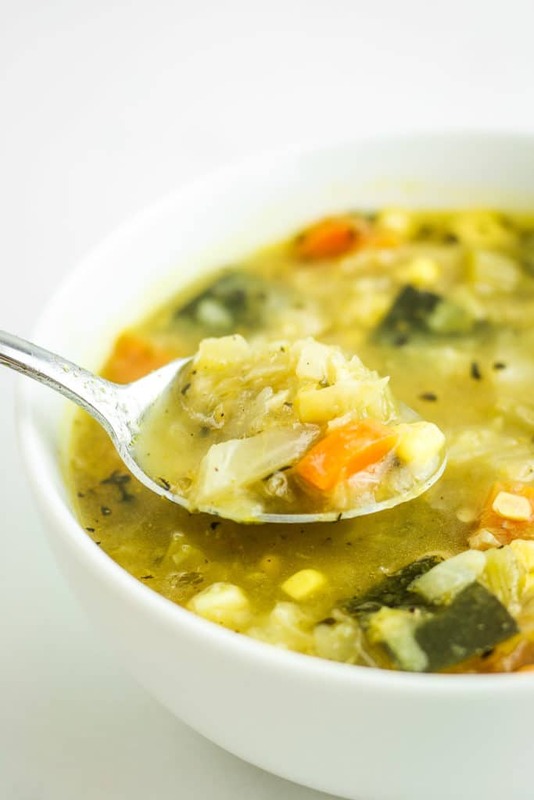 I’ve heard a bunch of buzz about this thing called a “cabbage soup diet.” Apparently it’s a popular way to “detox” and lose weight. None of these factors have anything to do with why I’m sharing this soup recipe today. To be honest, I don’t know anything about all of that. 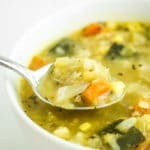 What I do know that this cabbage soup is good and that it’s good for you. And if you ask me, that’s good enough. 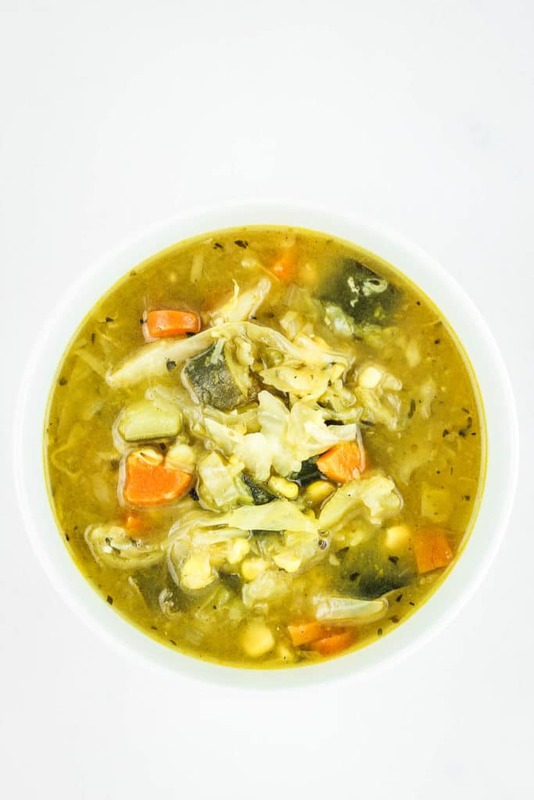 This cabbage soup includes some of summer’s best produce – fresh sweet corn and zucchini. If you’re making it in the winter, you could easily sub in other seasonal ingredients like broccoli, chickpeas, potatoes, etc. The process is incredibly simple, especially if you’re using an instant pot. (If you don’t have one yet, GET YOU ONE.) You start off by sautéing the onion, carrots, celery, and garlic in the instant pot and then add everything else in – cook for 20 minutes and your soup is ready to go! If you don’t have an instant pot and want to make this soup like NOW, you can start sautéing in a large pot, then add the other ingredients, bring to a boil for 5 minutes and then simmer for the remaining time. Either way, you’re gonna love it! Make this instant pot cabbage soup ASAP and show it off on Instagram – I wanna share your food on our stories! Yum! Added random, tiny potatoes I had. Thanks! I’m so glad you liked it. Thanks for the tip on adding potatoes! Very bland and tasteless. I had to add a can of Rotel after cooking. Love cabbage, but the corn does nothing for this and to me it was a failure. I’m sorry you didn’t like this recipe! I always enjoy it when we make it. You could certainly add more seasonings if desired. Anyone know the calories per cup? Hi Faith! This soup has about 73 calories per cup. I’ve updated the recipe to show all nutritional values! So good. I used turkey broth and used 1/3 cup diced spiced summer sausage (what I had) Yum. We have made it twice and it is turned out what’s my wife and enjoyed it very much. That’s awesome! It’s such a good soup!